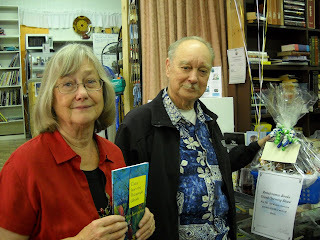 Eileen Kernaghan was guest poet at Renaissance Books' March Open Stage poetry night, reading from her recent collection Tales from the Holograph Woods: Speculative Poems. Also reading were fellow Burnaby Writers Society members Mary Choo , Julie Downsbrough and Franci Louann. Renaissance Books is located at #43- 6th St. at Carnarvon in New Westminster.